The Underworld presents: Grave Digger and Burning Witches, plus support, Price: £20.00 adv. For almost four decades, GRAVE DIGGER have embossed the international heavy-metal scene like almost no other band. Founded back in 1980 in the small town Gladbeck in Germany, the band featuring mastermind Chris Boltendahl generated their very own unique style that spreads, labeled as "True German Heavy Metal", fusing elements of fear, fright and headbanging Today GRAVE DIGGER albums like Heavy Metal Breakdown and Witch Hunter are amongst the best known genre classics. 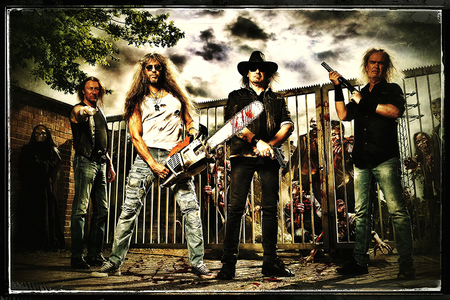 Composed and released in the mid-80s, these masterpieces established GRAVE DIGGER as a scene pioneer and proved to the world that they stand for high quality and pure heavy metal without any compromises right from the beginning.